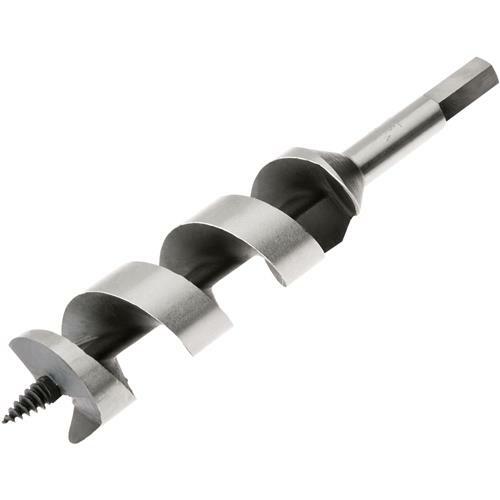 Screw Tip Auger Bits, 1-5/16"
Steelex Plus - Screw Tip Auger Bits, 1-5/16"
The tapered screw tips on these auger bits helps to make sure your hole ends up where you want it! Hex shank is sized to fit into 3/8" or larger hand drills (not recommended for use in drill presses). Size: 1-5/16". Length: 7-1/2". Worked GREAT!!! I originally bought a forstner bit to do the job, but found that once I started through the "Jig" there was nothing to hold the hole true. Bought the auger bit and found that my drill was not strong enough to turn the bit very long. Ended up starting the hole and drilling a pilot hole in center to remove the bite that the bit had on the screw tip, left the "Jig" in place and ended with a perfect hole.